People who live in Scandinavia are not only blessed with good looks genes, they tend to lead a more holistic and nature appreciating lifestyle. Yes, a lot of time is spent outside, which can ‘weather’ the skin but I know many people whose skin is beautifully enviable and leads to a question ‘what do you use on your skin’ ? 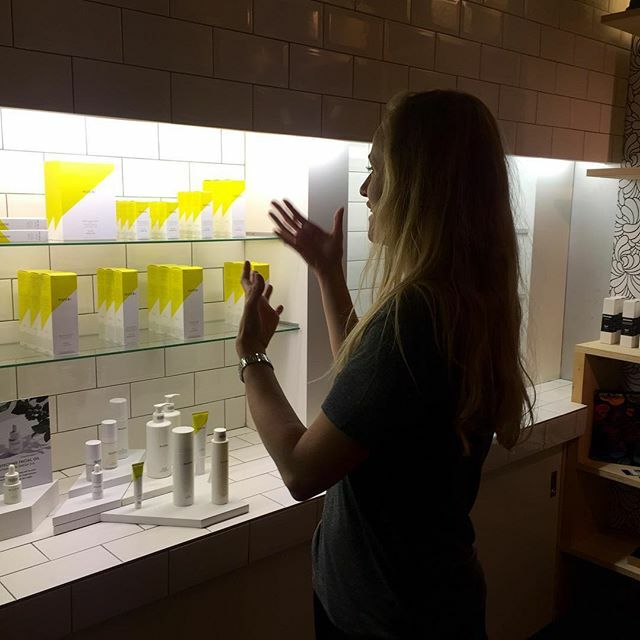 When Content exclusively launched Nuori skincare products in September, I jumped at a chance to meet Jasmi Bonnen and ask her about her ‘fresh skincare’ concept in person. Jasmi used to work at L’Oreal and having researched the subject of skincare ‘shelf life’, she decided to create her own line of products ( at the moment there are eleven ) based on the principles of efficacy and freshness. We prefer to eat fresh food, so Jasmi applied the same concept when creating Nuori, making sure that products are created in small batches every 12 weeks. You have ingredients of natural origin, which are also pure, as they don’t contain synthetics normally needed to extend shelf life. Add to that vitamins, amino acids, plant extracts and essential oils and you get a ‘freeze frame’ of what Nuori is about. When you pick up any Nuori product you have two dates stamped on it: a ‘start-using-by date’ meaning the time by which it is recommended you start using the product, at the latest, as the ingredients would be most potent and the more familiar ‘expiry date‘, which is when you should replace your Nuori product with a fresh one. My first purchase was Vital Foaming Cleanser, which had a start date of November 29th, 2015 and an expiration of February 16th, 2016. Initially, speaking to Jasmi, I found the concept a little baffling but as I started using the products the concept made more sense. I buy my food fresh and enjoy the freshness and maximum nutritional value that it gives to my body, why shouldn’t I do the same for my skin ? I remember my grandmothers making strawberry or egg masks for their faces, so this concept, if you think of it, fuses the past and the present of beauty perfectly and sums up Nuori message to its customers. 1) you have efficacy of active ingredients that aren’t weakened by time-related breakdown of potency. 2) you have skincare that is pure due to the absence of preservatives or synthetics that normally extend the shelf life of products. – made from 100% natural essential oils; each product varies slightly in composition but the cleanser, for example is made from 99,80% ingredients of natural origin & 0.20% of ingredients are nature-identical. As I said, following my conversation with Jasmi, who by the way has beautiful skin and hardly wore any make-up, yet looked glowing straight off the plane, my discovery of Nuori skincare started with Vital Foaming Cleanser and even though initially the smell seemed a little strong, within a day I realised that I loved it, due to the comfort and joy that smelling it evokes. It has a texture of creamy gel but is in fact a foaming cleanser. I have used it from September onwards & can now say that it works well irrespective of the season. Pomegranate enzyme and Radish root extract gently and effectively cleanse the skin and remove environmental dirt and make-up, as well as slough away dead skin cells. Oat kernel extract and natural betaine offer antioxidant protection, while also combatting redness and minor irritations. Botanical glycerin helps to maintain skin’s natural moisture level. When I use this cleanser daily (one pump is enough for your whole face, as it has a richly nurturing consistency) my skin feels soft and looks radiant – I wasn’t sure about the foaming texture when I read about it on the box, as my experience with foaming cleansers is varied but I can understand now why this product is so popular among Nuori customers and will definitely be repurchasing it again. My next purchase was the Vital Facial Cream ( contained in a glass bottle, so do handle with care, so it doesn’t slip out of your hands in the bathroom ) that promises to hydrate & smooth, as well as offers antioxidant protection. It has a rich texture but sinks into skin quickly and effortlessly, leaving behind a faint flowery smell, making me think of wide open spaces and untouched oasis of nature. Formulated with Hyaluronic acid, the cream delivers hydration and plumpness to the skin, thus improving its external appearance by working on deeper epidermal layers. Botanical squalane, jojoba and sweet almond oils help to nourish the skin, especially when the weather turns and it becomes colder outside. Add to this a complex of nurturing shea butter, brightening Vitamin C and Vitamin E, that offers antioxidant protection and you have a powerful formula that helps the skin function at its optimum level. I use this moisturiser in the mornings, sometime over the serum, sometimes on its own and try to remember to extend it on to my neck, which often gets neglected until signs of ageing become noticeable – prevention is always better than cure .) Due to its list of ingredients and texture, this cream can be used all year round, according to the ‘feedback’ from my skin and it is an ideal base for those of us who want to apply make-up pretty much straight away. When I was talking to Jasmi, she had a very interesting steel machine on the counter at Content, that pumped out miniature samples of Nuori vital hand cream, one of which I took home. Light-textured and with a pleasant smell, I continued taking notes with my hands feeling nurtured as well – one of the benefits of covering the subject of beauty, having conversations with fascinating people working within the industry, while trying the products during the dialogue. Last but not least on my review list is the Vital Body Balm that was recommended to me by one of Content’s staff who really enjoyed using it. Having used it for several weeks I can say that not only does this balm hydrate the skin but it makes you actually want to remember to apply it regularly post shower or bath. My skin was a bit on the dry side after the summer holidays and even though I didn’t apply this body balm daily, I noticed at least a visual improvement pretty much as soon as I started using it. I like the pump that dispenses the right amount of product and the orange-vanilla scent, as well as the rich texture of the balm that sinks almost immediately and makes my skin feel soft, even if it felt dry and lacklustre before the application. Nuori’s signature blend of avocado oil, shea butter and olive oil-derived glycerin really nurtures the epidermis and helps to restore elasticity of the skin, while grape seed oil and vitamin E offer antioxidant protection to your biggest organ. For me this is one of those body care products that actually delivers visible results and using it becomes a good habit that does improve condition of the skin.